In 1709, John Hartwell acquired the 1650 acre Swann’s Point plantation that included Mount Pleasant. The tract eventually fell to Richard Cocke IV around 1730 when he married Hartwell’s daughter and heir, Elizabeth. About 1750 they built the present dwelling and later it was named Mount Pleasant. Chimney base in the South field. There are no surviving plats, maps, drawings, or insurance policies to indicate the location of any eighteenth-century structures at Mount Pleasant. However, archaeological testing and ground-penetrating radar have discovered a cluster of outbuildings that extend north to south just off the east wing. The northernmost outbuilding closest to the wing, Structure I, measures about 18‘ by 27‘ and may be as long as forty-five feet. Adjacent to the foundation of this structure is a five-foot deep cellar that is either an addition or a separate, perhaps earlier, building. The cellar fill contains a wealth of artifacts and seems to have been filled around 1800. Thimble and gooseberry bead found in the South field at Mount Pleasant. About forty feet east of this building is a second cellar, Structure II. 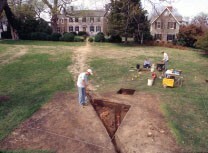 Although the cellar has been tested, the rest of the structure has not been located. This cellar also was filled in the late eighteenth century, and produced several intriguing artifacts including two cowrie shells and glass beads. Cowrie shells, which come from either the Indian Ocean or the Caribbean, are associated with enslaved Africans. A third eighteenth-century dependency is located immediately south of Structure I where testing uncovered several foundations, both continuous footings and brick piers, that represent either a single large eighteenth-century structure or possibly two separate buildings. Cowrie shells and glass bead. Artifacts from the site in the south field suggest that it continued to be used through the eighteenth century as well. Also, there is a probable slave quarter site in the northwest corner of the west field. The archaeological testing and ground-penetrating radar survey both indicate that there are no corresponding structures on the west side of the house just as there is no archaeological evidence that there ever was a west wing at Mount Pleasant.